Every day in Orleans Parish, the Police issue to unsuspecting citizens, record numbers of Municipal Court MIP summons – a Minor in Possession of an Alcohol Beverage citation. People have been simply holding a drink for a friend or relative in Orleans Parish, and the next thing they know, an undercover cop is writing them a MIP ticket for underage drinking; without regard to any actual consumption of alcohol. 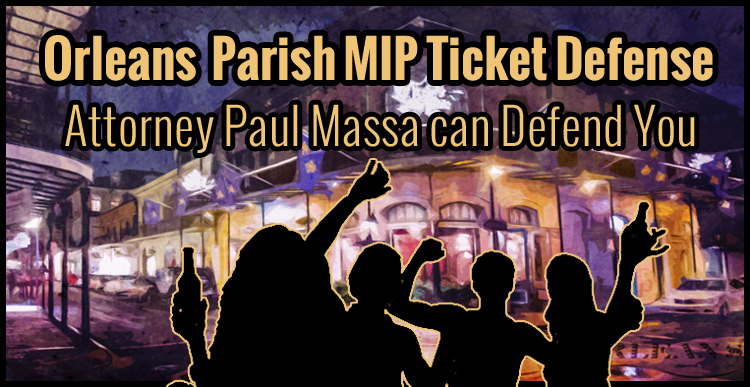 To completely understand your options, please contact New Orleans MIP Lawyer Paul Massa immediately, using the intake form on this page. After I have reviewed your ticket details, I will personally send you an Offer of Legal Representation, explaining the benefits and costs. Often I am able to send you this information within a few minutes after you have submitted your information on this website's intake form, day or night, every day of the week. The important step to take is submit your information to me, Attorney Paul Massa, on the form on this page FIRST. Under no circumstances should you ever Plead Guilty, or Pay a Fine, to the City of New Orleans, or State of Louisiana, for a Minor in Possession (MIP) summons, citation, affidavit, ticket or arrest in Orleans Parish before you understand the consequences of being charged and convicted of this municipal misdemeanor. It will more difficult and expensive for you to undo this mistake than resolving the charge will be in the first place. Simply stated, a guilty plea for a Orleans Parish MIP on your record for the next 10 years can adversely effect your ability in the future to get a job, college of choice, or membership to a professional guild. Do not put your future and opportunities at risk. Contact New Orleans Minor in Possession Attorney Paul M. Massa for a FREE consultation by completing the brief form on this website. After completing the form, if necessary call me direct at 504-975-6606, if I am on the other line with a client, or in a courtroom at the moment you call me, please leave a detailed message, so I can act on the message regarding your question or concern, when I hear it. Underage drinking Attorney Paul Massa has been helping young adult citizens from across this country since 1991 with legal representation services in Municipal Court's around the State of Louisiana. In this State, far and away, the City of New Orleans is the leader in issuing MIP citations on Bourbon Street in the French Quarter, every day and every night, year round. Leverage the legal experience of a New Orleans Minor in Possession Lawyer Paul Massa to work for your defense to successfully resolve this criminal misdemeanor charge TODAY. A relevant news report/editorial that provides an insightful background to the New Orleans / Orleans Parish MIP charging epidemic in the city named MIPs, misplaced priorities can be viewed here.